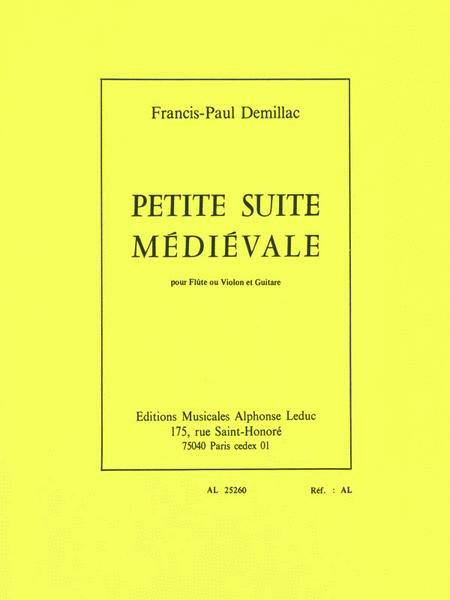 ?Composed by Francis-Paul Demillac, Petite Suite Médiévale is a small, quite easy work for Flute or Violin and Guitar. The volume includes score and parts and is dedicated to Vrouyr Maznanian. This suite lasts six minutes and features five short pieces influenced by medieval sounds: I. Sicilienne ' Moderato II. Sonnerie ' Allegretto III. Après une page de Ronsard, 'À une jeune morte' ' Andante IV. Ronde ' Allegretto Born in Paris under another name Francis-Paul Demillac (b. 1917) was a violinist and a professor. He played in the Symphonic Orchestra in Paris and was part of the Maurice Hewitt Quartet.andrdquo.